Stretch Goal Cores, New Rulebook, and Color Proofs, Oh My! Greetings, mecha fans! It’s been a little while, but we’ve been hard at work getting Wreck-A-Mecha ready for you all. Above you can see some color proofs we just printed to ensure the details look just right. If you look closely you might notice the new, more refined key artwork on the right. This is used on the front of the box as well as the soon to be released wallpapers. On the left we have cards, cards, and more cards. The artwork here includes new shading details and other visual effects that have been added since the Print and Play version was released. 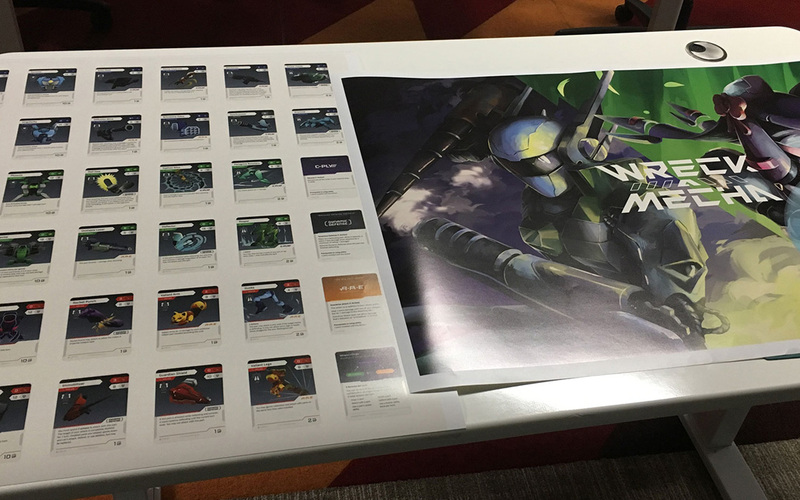 We’ll be updating the Print and Play files (for those who had it included in their tiers) to reflect these new artwork changes as well as our new rule book. The rules of the game have not changed, but our new rulebook streamlines the information and lays it out in a much more attractive manner. It has more diagrams and less words while still saying just as much and clarifying everything you’d need. We’re really happy with it. And we’ve managed to fit it into 4 small size pages even with the diagrams. That is how simple it will be for newcomers to get in the game. No daunting rule “novels” here. Art and abilities for the new stretch goal cards have been finalized. We’ve playtested to ensure their abilities are on par with original cores to retain game balance. Core have precious, once per game abilities that can give you the upper hand in battle. Here’s what the new stretch goal cores can do. Pavise (1 Action): “Choose 1 of your parts (even if it is your core). That part is invulnerable and may not take damage during your opponent’s next turn.” Sometimes you need a critically damaged arm for just one more turn. Or perhaps your core is exposed and vulnerable, but protecting it for one turn will get your mecha back into a healthier, defensive position. Pavise helps you cheat death and make it happen. Mirage (Free Action): “Gain 1 additional action this turn.” With only 3 actions per turn, you often have to make very difficult decisions. Mirage gives you the flexibility to do more. It may not be as individually powerful as some of the other core abilities, but its versatility is completely unmatched. Singularity (Free Action): “You may immediately draw 1 card for every 2 victory points your opponent has.” Drawing cards takes valuable actions that could be spent elsewhere. If you’re opponent has been stockpiling victory points, turn the tides by filling your hands with new arms and legs without even spending an action. That’s all for now. Remember, if you missed the Kickstarter campaign, you can still pre-order the game here.